Hello! We hope the sun is shining where you are, we are in full swing here at Tineke, busy creating lots of beautiful blooms for all the wonderful spring weddings coming up! You may have seen that our very own Kerry & Andy have recently got engaged WOOHOO! We are totally over the moon for them both. It got us thinking, wouldn't it be nice to share what it's like when you're planning a wedding when you work in the industry? 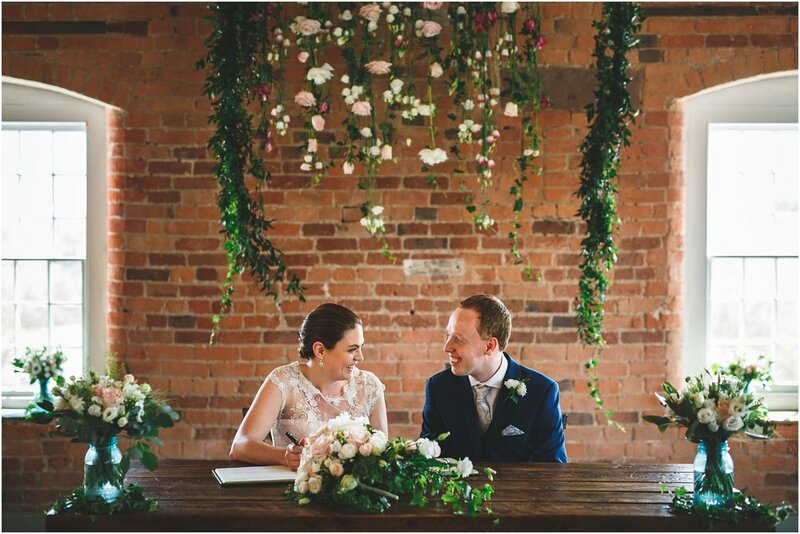 Over the next few months we'll be sharing tips, advice and good old checklists about the different stages of planning a wedding and we'll even be throwing in some industry insider knowledge and experiences too! One thought on everyone's mind we're sure are 'Kerry's flowers!' We'll definitely be covering those too, along with discussing: venues, guest lists, THE DRESS, choosing your bridal party, catering and much more. If there's anything you'd like to see us cover, just let us know! Today, we're going to start right at the beginning! The engagement and what on earth do you think about first? First things first where's that champagne!? Celebrate just the two of you, this a really special moment, and ladies, whether you knew it was coming or not, nothing can prepare you for the most amazing feeling when you say 'yes!' and there's a little sparkle on your finger! Chances are that wearing your engagement ring will take some getting used to and all of a sudden you'll be flamboyantly taking with your hands! Which leads us on to the next little tip. Get those hands and nails looking fabulous. We're not sure you need an excuse to go out and buy some new nail polish or a luxurious hand cream but what are you waiting for? Everyone is going to want to see your beautiful ring, so why not show it off? How about a lovely French manicure or your fave nail colour with your ring finger a different colour? Next up it's time to tell your close friends and family, and what a great moment this will be. Prepare to be overwhelmed by everyone's happiness for you and your cheeks will be aching from all the smiling! Whether you choose to have lots of intimate moments, throw a big bash or send out surprise 'We're Engaged Cards' make sure you treasure this experience. So now you've celebrated, you've let everyone know, you're still getting used to saying Fiancé but it's starting to sink in! What's next? "The weird thing is, I help with so many weddings, but feel totally lost about budget!" Kerry. There's nothing like the talk of money to bring you back down to earth, we know it's boring and practical but it's a necessary part of your wedding planning. Nothing has to be final at this stage but having an idea of your budget and expectations will make things a lot easier. Try thinking about how much you can realistically save up, the length of engagement you'd like and it's good to know if any family members will be contributing to the wedding fund also. Hand in hand with the budget come the ideas. What sort of wedding do you want? Small and intimate, a grand affair or a jet setting destination wedding? Begin with a little research and find out what's important to you both, what you styles you like and DON'T and who needs an excuse to get pinning!? Being in the industry we often use Pinterest for inspiration and to keep up to date with current wedding trends but nothing beats starting your own pin board full of beautiful things that could become a reality. A little word of warning! It's totally addictive and easy to wind up creating a whole host of different styled weddings. Stay true to yourselves and use it as a guide, we'd also recommend having a read of wedding blogs. Seeing how real brides and grooms planned their wedding day can be a huge inspiration and you may even find suppliers you like the look of. Finally and perhaps most importantly, enjoy it, relax, take your time to remember special moments and fall wholeheartedly in love with being engaged! "I am absolutely loving being engaged and cannot wait to be a Bride as I thought it would never happen! We have been together for over 12 years - Andy is my best friend, and always so supportive of me and the business! We are thinking about Italy for the venue, so far that’s a bit of a minefield!" Bride to be Kerry @ Tineke Floral Designs! And in case you were wondering about the picture of the Converse shoes... this is where Andy hid THE ring for 2 weeks! Your wedding day should be a reflection of you and your other half. That is what we do best at Darby & Joan. We have spent the last three years creating relaxed weddings that add personality and heart. As a wedding supplier myself, I can't stress enough the importance of you finding people and companies who understand you and get where you are going with your plans. I spend hours and hours with my couples: meetings, venue visits, telephone calls, endless emails and a couple of days setting up and delivering on the day itself. You will be spending a whole lot of time with these people and you should like them! Whether we are talking about a florist, a photographer, a wedding planner or a caterer you should come away from your meetings with them feeling confident in their abilities and on top of the world that you have found someone who you trust to bring something special to the wedding. Of course personal recommendations and checking out their portfolio of previous weddings and events are important too and their communication with you during the whole process will be a good indicator of their ethics and commitment to you - and this all comes down to trust. How a supplier makes you feel in those first couple of hours of meeting is ridiculously important. We won the Best National Venue Stylist Award for the National Wedding Industry Awards 2014 recently and one of the reasons was our customer service. We won the award because of our commitment to each event and because we really are rather good at it! If you want to have an all out themed wedding where every inch of it has been planned and executed to perfection, then do it. You may lose a little sleep during the process but that is where a wedding planner or stylist can come to your rescue and pull your ideas together and execute it all for you on the day. It is so worth sitting down in the early days to address how much you can afford to spend. Decide what are the most important aspects to you guys. Is it a show stopping venue? A dress to die for? A photographer to capture every minute or do you want to spoil your guests with a fabulous meal and entertainment to wow? It is your day and you should spend your money on areas that YOU revel in and get excited about - it shouldn't be about a subconscious competition with a friend who got married last year and certainly shouldn't be about outside pressures from family to follow traditions that don't reflect you as a couple. Getting creative - a little research on Etsy can pay dividends if you are a relatively creative bride who wants to add a touch of personality to their day. It is an on-line market-place bursting at the seams with wedding day ideas, accessories, fashion and now they even have their own wedding gift list. So, my wedding day? We skipped tradition and got married in Las Vegas. A two week holiday with both sets of parents where we spent a week in Vegas then hopped over to San Francisco for a week's honeymoon with the parents in tow. A white trouser suit and a pair of Jimmy Choo sparkly sandals. We did it our way and we wouldn't have it any other way. Hope you are all well and have enjoyed this lovely summer we have been lucky enough to have. Over the last few years creating wedding flowers, I would say we have had some very lucky brides this year with the weather. Today we bring to you a stunningly, beautiful wedding at Stapleford Park last month. Natalia and Andy chose gorgeous pastel shades to go with the lace bridal dress and pale pink bridesmaid dresses. Our friend James White was there to create wonderful bridal hair and the guide on how to trim beard and the amazing photography was by Dottie Photography. Hope you enjoy them! This evening, we bring to you the beautiful wedding of Natalie and Andy married in May at Norwood Park in Southwell. This couple were such a dream to work with, and both so involved with the flowers which was so lovely. We loved all of the personal and gorgeous touches by the bride and groom, so much lavender everywhere - simply beautiful. Hope you enjoy the pictures as we much as we did, by the fabulous Neil and Becky of Butterworth photography. We hope you enjoyed this post. If you are interested in our wedding flowers, please find more information here. Gift bouquets can be ordered for UK delivery here from our Derbyshire studio. Hope you are enjoying this little glimmer of sunshine!Today, we bring to you a very special wedding as the Bride is one of Kerry's best friends, and Kerry was also bridesmaid, as well as the flower sheriff for the day! It was such a lovely change to be involved with the wedding from start to finish. The wonderful Becky and Neil of Butterworth photography captured the day beautifully and were brilliant on the day. It was also great to see Phil at Lafbery cars chauffeuring some of the bridesmaids to the wedding and also DJ Ferret of Promo disco services who made sure the dance floor was always full. Rose from Pink Cake Box created a lovely cake complete with figures of the Bride, Groom, Flowergirl and Jane's special horse! Hope you enjoy these images! Congratulations Jane and Jonathan, we love you both lots! If you would like further information about wedding flowers click here or call 01335 370 700 for availability. Bouquets can be ordered here 24/7 designed by Tineke.